After MUCH prayer and debate, we have decided to move. Doc has been overwhelmed with work for about 2 years and our family time has been suffering. He has been going into work by 6:30 am and gets home at 6:30 or 7 pm. He grabs a bite to eat, helps me tuck in the kids and then from about 9 to 11 he does his dictations. On top of that he has call twice a month and weekend calls every 7th weekend (or so) and rounds every Saturday for 3 or 4 hours, on average. We have been feeling pressure from all sides for a long time. There just aren't enough hours in the day to get it all done...and especially not all done WELL. His kids are very important to him (as am I) and he has just decided enough is enough. We are moving closer to family and he is trading in his 60 - 70 hour weeks for an 8 to 5 job with NO WEEKENDS! Yay!!!! The kids and I aren't going to know what to do with him around so much! It will definitely feel like a much needed respite for both of us. With all that change, comes one big one...we are selling our house. It is official. There are signs in the yard and the local realtors came to an open house yesterday! The saddest part about selling our house is leaving our wonderful neighborhood! We have made dear friends here and I'm just trying not to think about leaving them...I'm trying to focus on the good!!! Please check out the blog that I made for the house and pass on the link to anyone who may be interested in seeing it! Click on the image below or on the side bar of our house to go take a tour! I want your house! I understand wanting to be near family, but having a house like that sure would be hard to leave. It's amazing. I wish I could move there, like tomorrow! !, but I'm stuck in Ohio! My orthopedic doctor works more than (and sometimes more), but he doesn't have a family. I completely understand why you want to move. That kind of work schedule is a recipe for burn out. Keep us posted on everything! I love your new house blog....that was some serious WORK....glad that aerial shot came in handy. lol. It DOES add to the perspective. I have forwarded the link on. I saw someone stop to take pictures yesterday. K had a breakdown today when I told him you guys were moving. He though he would NEVER get to play with C again. So sad....perhaps with more distant neighbors you won't have the perpetual play-date going on. It is hard to explain to a 4 yr old WHY we can't all live together. When you were gone this weekend..Big brother just new you had already moved! He was so upset!>..I said No no! They haven't moved..they are just letting people look at it! They are not moving yet I promise! This calmed him somewhat..but was not satisfied until he saw your SUV in the driveway..*Sigh* They're back mom! Hi there. New here but thought I would leave you a comment. 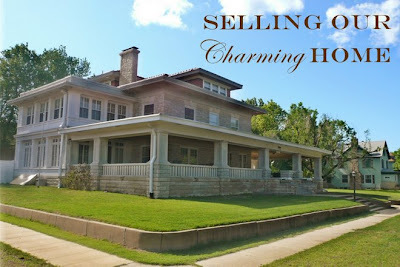 Yor house is charming! I'm sure you will have no trouble selling and having that extra time with your huby will make it all worth while. "Make new friends, but keep the old ones...One is silver and the other gold...." One of those "jump in on ya" songs. :)Oh, here's another "Silver and gold, silver and gold" wait, that's Frosty for Christmas, not so app.